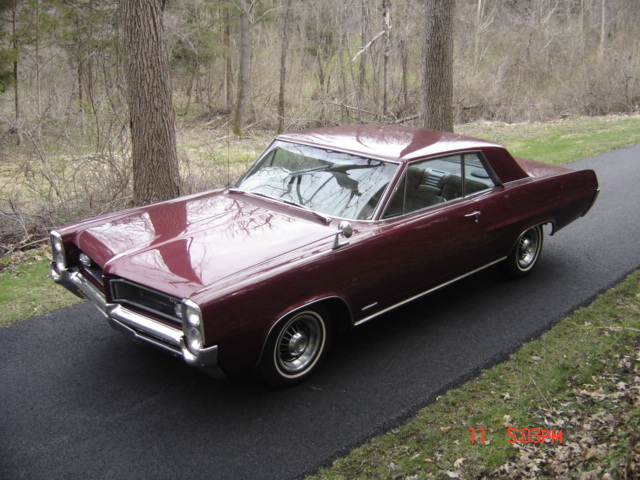 This GP has only 74,000 Original & Documented Miles. Has An Excellent Rust Free Body With Older Marimba Red Paint - Which Still Shows Super. It Also Has A Beautiful - All Original & Rust Free Undercarriage Throughout. Rechromed Bumpers. The Light Saddle Interior Is Very Nice. Features Bucket Seat - Console Mounted Floor Shift - Console Mounted Vacuum / Power Gauge. Other Options Are - Power Steering - Power Brakes - Power Windows - A/C - Factory Tinted Glass - Very Rare Tilt Wheel. Power Is Supplied By The Original Numbers Matching 389-4V / 303-HP Trophy V-8 - Transmission Has Been Up-graded From the Slip & Slide 2 Speed Slim Jim To A Rebuilt Turbo 400 For Dependability & Better Cruising Pleasure. Rear Has 3.23 Ratio. It Also Has The Very Desirable & Ultra Rare "Kelsey Hayes" 8 Lug Aluminum Wheels.